The book Encounters (Bristol: Arnolfini, 2007; ISBN 978090773842) by photographer Manuel Vason reproduces 162 images created in collaboration with 36 solo artists and artist collaborators working within performance and live art. As Dominic Johnson describes in his introduction, these images were created in a collaborative approach specifically for the camera – though usually based on the artists’ live performance practice. It’s difficult to generalise over such a broad range of images, but for the most part the images present the variously altered bodies of the artists, framed clearly with little extraneous clutter. They are bold and striking images, showing bodies in states of extremity or with extraordinary appendages or costumes. They seem designed to have an immediate impact: I am compelled to linger over each one, because they take time to process the emotions and connotations they evoke, but almost always the information of the image is completely available at first glance. Like the work of the artists represented, the images range widely in style and setting. Some depict interactions or interventions in specific environments, while others are set against neutral backgrounds. Some artists stare directly at the viewer, and others are depicted in mid-action. In all of them is a clear interaction between an artist’s sense of performance and the photographer’s sense of composition. This interaction between the composition and the represented action creates a beguiling paradox of reality and artifice. 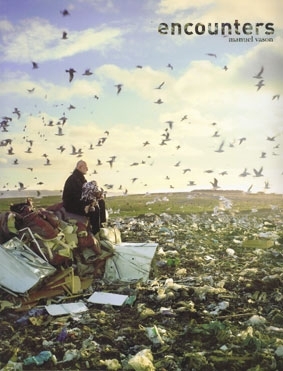 It’s hard for me not to feel as if the power of these images comes largely from the reality of the unusual and often extreme acts which they portray: yes, those feathers go completely through Kris Canavan’s arms; yes, that’s real wreckage of a real building within which Veenus Vortex is intertwining her real body; and so on. But although the strength of these images derives partly from the power of the events they document, they are not the same as those events. In looking at this collection of images, I also think of the images photographed but not reproduced in the book – the number of approaches, angles, and photographic adjustments that were tried in the production of each image. The image I am seeing on the page is the one which is most sharp, where the lighting was most effective, where no one blinked or there was no unwanted interference, and so on. In other words, the real and presumably often painful acts notwithstanding, these images are fabrications, even simulations. I know this is, of course, the paradox of the photograph itself – it resembles the real so well that it is no longer real (even though we usually prefer it to the real). And I’m not suggesting that there’s any unacknowledged duplicity in these photographs – they are very aware that they are constructed. But the way the images in this book work with the tension between reality and artifice makes me reflect on the way this happens not only in the photographic image, but also in the live performances of these artists. Most of the works in this book address the nature and vulnerability of the body, and an obvious interpretation of these works might be that they affirm the reality of the artists’ bodies, and of “the body” itself. But what if we instead think of these works as challenges to that apparent reality? For even when the bodies are really in the room with us – bleeding, breathing, contorted, exposed – they are carefully planned fabrications. The images in Encounters might be seen not as presentations of the reality of these bodies, but of the ways in which we represent them – and, less obviously, so too might the work upon which the images are based. Along these lines, some of the pieces I like best in this collection are those that rely least on the extremity of what they represent, but instead those that question the processes of representation and seem most aware of themselves as photographs. 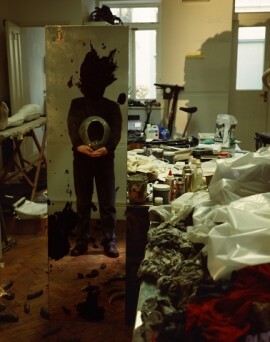 The way Stuart Brisley is concealed and revealed within the site of fabrication, his studio. The way Miguel Perreira, his body obscured by black tufts of something animal, seems also to have been scratched into place from the border of the page that holds him. 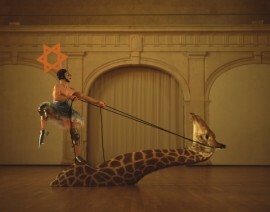 Or the way the image of Steven Cohen in costume atop a giraffe’s head seems simultaneously to both claim and refuse the authority of an anthropological document. These images reject any potential truth-value of the image (and of the body), and instead seem to embrace a value that derives from artifice, from simulation, and from everything that surfaces when we encounter the bodies and lives of others. Theron is a writer and performer based in London. His writing focuses on relational aesthetics, theatricality, and the ethics of representation. He was selected for Writing from Live Art (www.liveartuk.org/writingfromliveart), a Live Art UK initiative, and his critical writing has been published in AN Magazine, Dance Theatre Journal, The Live Art Almanac, Platform, Real Time (Australia), and Total Theatre.